Before 2016 is upon us and new projects begin, I’d better update all the December happenings… and there were many! I was pleased to be commissioned to do 3 works – an original piece, a “Sketchy Memory” piece, and a family heirloom piece, all for year end. 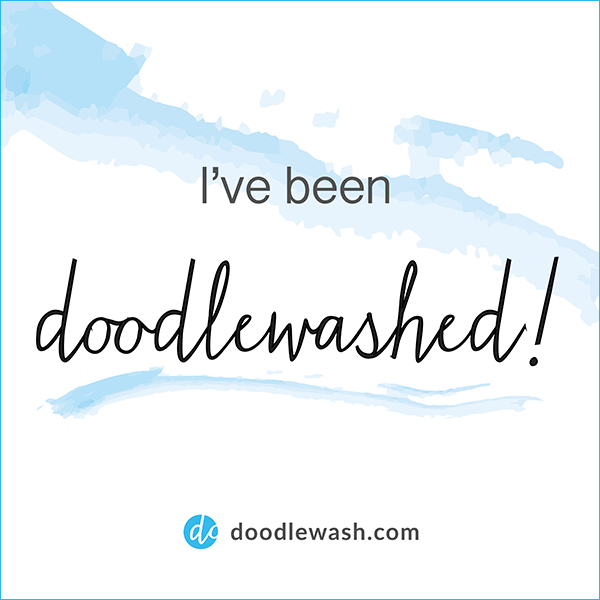 With the permission of these clients, I’m able to share 2 of them on the blog. The “Sketchy Memory” is of a pizzicheria (deli shop) in Siena, Italy, taken from a favourite travel photo. 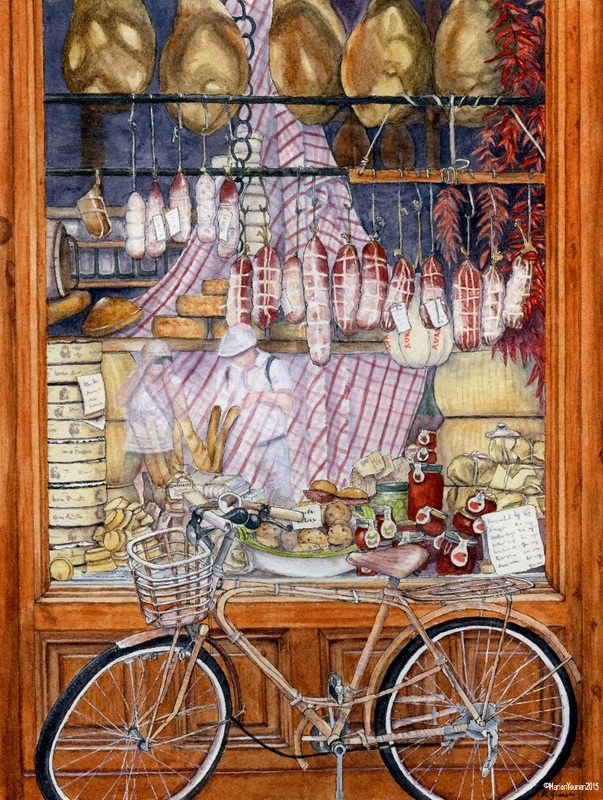 The client told me they were happily surprised to see their reflection in the window with all these yummy Italian specialities and the iconic bicycle, and so she wanted the reflection to be present in the painting. As a fellow lover of Italian travel, this piece was a joy to do. And it stretched my planning skills in a big way because the timing of what-got-painted-when was important. My client was unaware of the image’s fascinating history, but I told her that Google had a fair bit on the subject. 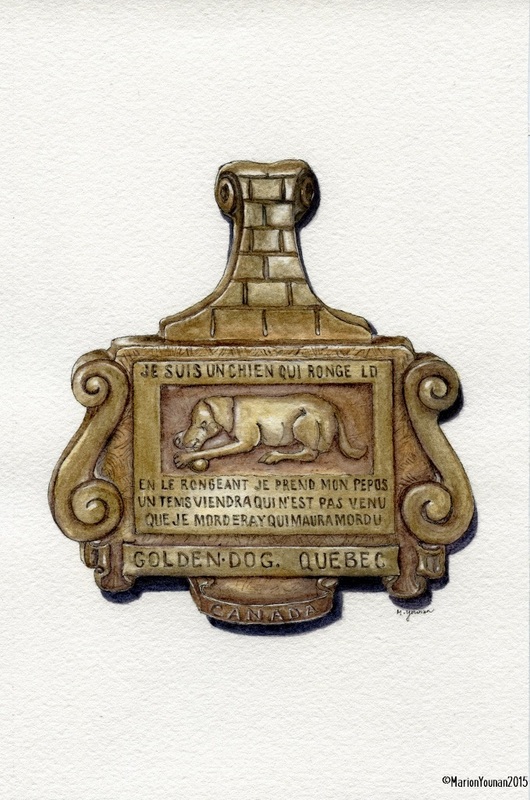 Seems this “chien d’or” image was also put on other items besides door knockers. 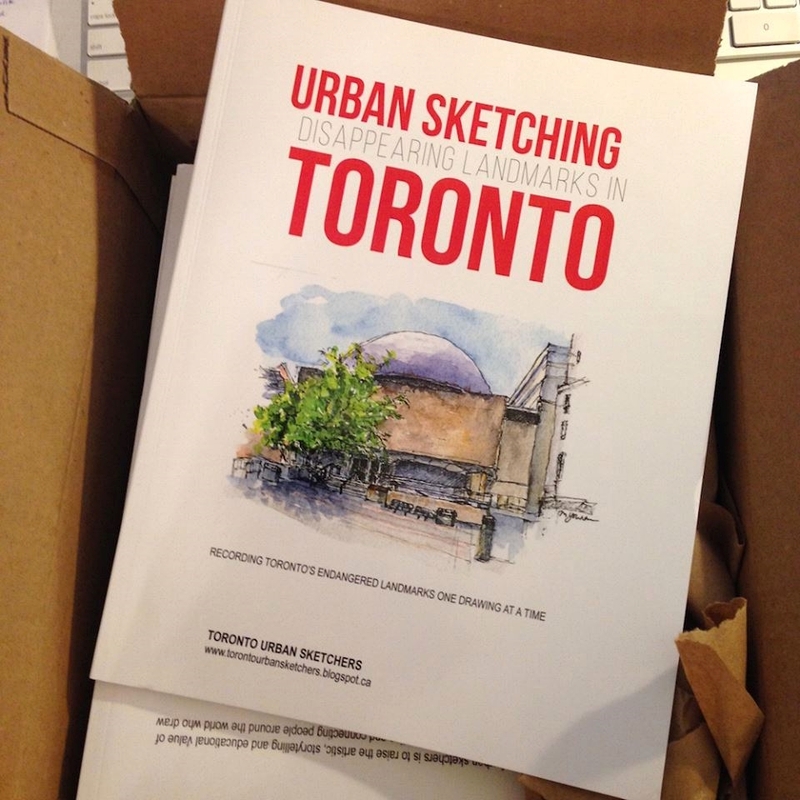 A final piece of art news – an urban sketch of mine was chosen for the cover of the Toronto Urban Sketchers first book, “Disappearing Landmarks in Toronto”. This is a project that our Urban Sketchers group has been working on for many months – drawing a number of heritage buildings and familiar landmarks in Toronto that are slated for total or partial demolition. I was so honoured to see my sketch of the shuttered McLaughlin Planetarium on the cover. The book was launched at our first Art Show in Toronto this month, and is now for sale on Amazon here. A busy December, for sure! Hopefully 2016 brings more of the same! Lovely and inspirational, congratulations ! Thanks much, Cindy! Happy 2016! I first checked this out earlier today, as soon as I returned to my desk after a filling lunch. Right away I was hungry all over again, for prosciutto and pancetta and salami and cheeses and olives and sun-dried tomatoes and crusty bread. Well done! And nice job rendering those reflections. Now I’m hungry after reading your comment! Thanks and Happy New Year! Thanks, Janina! Happy 2016 to you!